You cannot argue the power that a community of like-minded people has in helping you achieve your goals. They keep you accountable to follow through on your plans. They inspire you to pursue greater things. They relate to your struggles and encourage you. Most of all, you form meaningful relationships and a network of support. We runners know the value of a tight-knit running community. Running may be an individual sport, but very few runners achieve their goals without the support and encouragement of others. We runners also know the value of an individualized plan, tailored to fit your goals, schedule, current fitness, and running background. 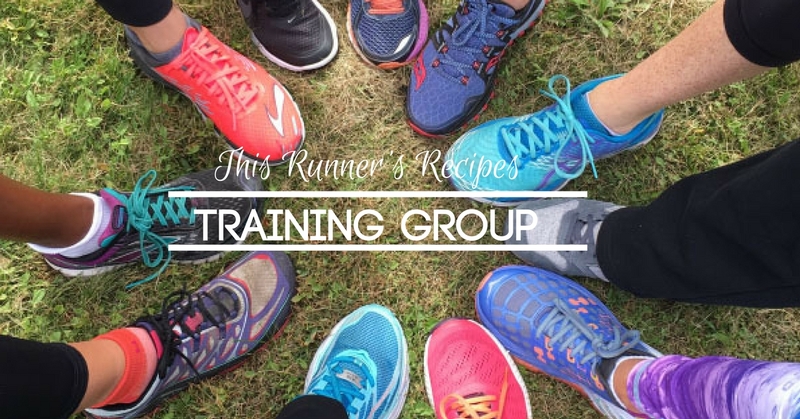 This Runner’s Recipes Training Group offers you the opportunity to be part of an encouraging community of runners while following your own personalized training plan. Unlike in-person training groups, you can be a part of this group no matter where you live and regardless of your work or training schedule. 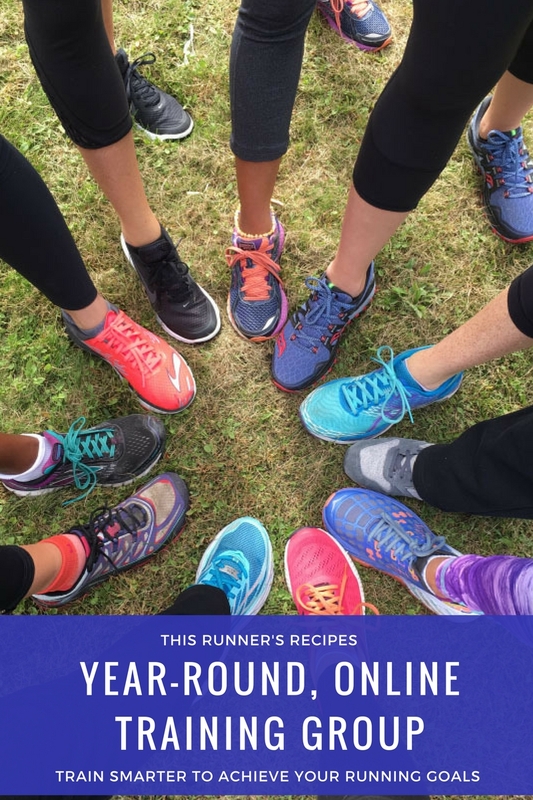 This Runner’s Recipes Training Group operates year-round – meaning that you can receive all of the benefits of a coach and a virtual training group no matter when you join. Beginner, intermediate, experienced, short distance, long distance, road, and trail runners are all welcome – yes, this training group is for everyone! There is also the option of joining the group without purchasing a training plan. You still receive the benefits of the group – the forums, support, discounts, and strength training library. This option costs $10/month and you can always upgrade to the full option with the plan. You’re a new runner: The group will provide you with individualized guidance from a coach along with the support and accountability of other runners. You’re an intermediate or experienced runner: No matter how many years you have been running, you will always benefit from the guidance of a coach and the support of a community of runners. You’re NOT training for a race: Working with a coach when you’re not training for a race offers numerous benefits. A coach will help you maximize your base building period while helping you recover from races and prevent burn out. This option is less expensive than working one-on-one with a coach during the off-season. You ARE training for a race: Whether it’s a 5K or an ultra marathon, you will receive individualized guidance to help you achieve your goals. You want to try working with a coach but want a more budget-friendly option. You want to be part of a community of like-minded, hard-working, supportive runners. I emphasize year-round periodization of training: base building, race specific training, and recovery periods are all an important part of your running, especially if you are looking to improve your running. You don’t have to be training for a race – I work with athletes at all points throughout the year. I believe in sustainable training to prevent injury and burnout. No workout or race is ever worth sacrificing your health or well-being – or your love of running. Instead, I focus on training methods that foster a love of running and sustainable improvement – meaning that you will improve season after season. Your workouts are specifically customized to your needs. Each training plan will include speed work, easy runs, tempo runs, and long runs that are 100% individualized to your current fitness, running background, goals, strengths, and schedule (don’t worry – I’ll explain each run in detail including pace and distance). Running is only part of the picture. Your plan will include strength training workouts and recovery practices like foam rolling. The forums will discuss everything from gear and running shoes to nutrition to fueling. Support, encouragement, and a voice of reason to keep you motivated in your running and inspired to pursue your goals while also preventing you from falling into the common trap of overtraining. Want an individualized training plan without the group? I also offer one-on-one virtual coaching with more feedback, more frequently updated plans, phone check ins, and more individual attention to you. Learn more about the one-on-one coaching plans here!